Welcome to Needlepoint in Paradise! 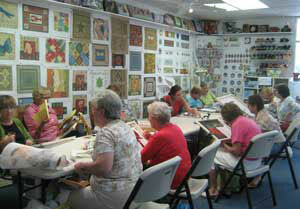 We are indeed a complete Needlepoint Paradise, with all you will need to start or finish a project. Whether it's a great selection of canvases, a wealth of fibers to choose from, expertise from our staff, instruction or finishing services, we have what you need to enjoy your needlepoint to the full. Don't miss Almost Paradise, our online treasure trove of clearance and consignment pieces at fabulous prices! Use the "Almost Paradise" link to the left. Check us out on Instagram by clicking here. and lots of specialty threads, beads, books, tools and accessories. We host several trunk shows a month featuring leading designers; check our trunk show link above for the schedule. We offer a 20% discount on trunk show items. Our walls are full of all kinds of wonderful canvas pieces, from the simplest baby sampler to the most complex wall hanging. If you can`t find what you want, we can order it for you! Use our convenient Designers link to the left to find your next work of needle art. Come see us or give us a call - our staff is friendly and knowledgeable and can help you unravel any stitching dilemma. We'd love to see you on your next trip to southwest Florida!